Hi! My name is Karla and this is Azura, this is Gigi, and this is Xavier. My husband and I, we first met Gabriela in 2009. 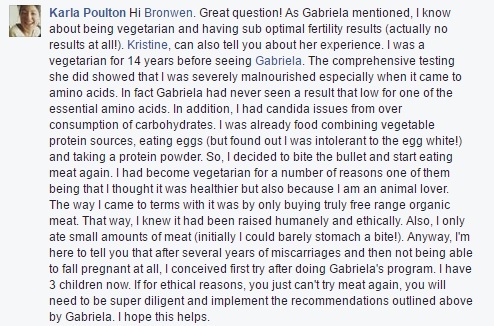 We’d seen a whole lot of naturopaths in the past, but what we really liked about Gabriela was that she had a more scientific approach but also a very holistic approach. When we actually met Gabriela, we were really attracted to her passion and her enthusiasm to help us, and I guess what really surprised as us well is that passion never really waned throughout our time with Gabriela. She’s gone out of her way lots of times to make herself available to us and to help us when we needed her. I guess Gabriela through this whole journey has really felt much more like a friend as much as a trusted advisor. There’s no doubt that the program requires some lifestyle changes, some of them big for some people probably, but the results have been life changing for us.We just really want to thank Gabriela for all that she’s done for us and all that she continues to do. If you are reading this, you may have also experienced the disappointment of not getting pregnant despite your very best effort to implement everything and anything you can think of/learn/trial. Thing is, that in order to implement the best solution you first need to know the problem your trying to solve, right? That’s what we do, and we have a track record of success to evidence it. We pride ourselves on our results and as such before we agree to consult with a couple we first ascertain if we can actually be of assistance in your particular situation. The way we do this is the Fertility Discovery Questionnaire, which is a free, comprehensive questionnaire that provides us a minimum amount of health information needed to discuss your individual requirements and to determine if we can help you achieve your family dream. If we believe we can help you we will arrange an agreed time for your one-on-one fertility consultation. comprehensive fertility methodology that is shown by international research to help 78.4% of previously infertile couples conceive.